A little while ago I was invited to submit a quilt for the next collection from Fibre Artists for Hope. As I would be their first international member I was honoured to be asked. The title is a play on words, with 'Broad' referring to the US vernacular for woman as well as the theme which was women who were or are active in social justice. I have chosen a portrait of charity worker and media pundit Camila Batmangheldigh who is the founder of the charity Kids Company, whih was a bit scary as this is the first portrait I have ever done. 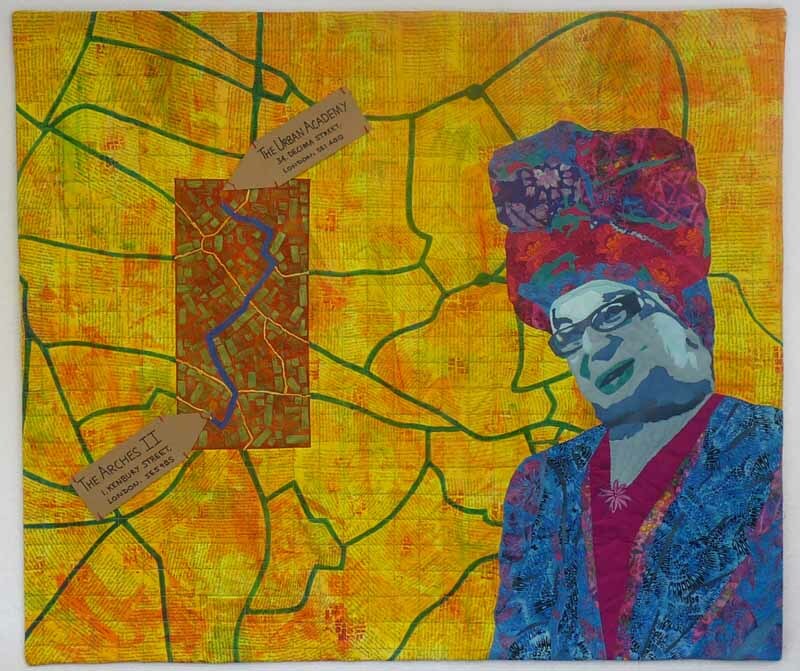 The quilt falls with in my new series using maps and handwriting as background and shows Camila, who is of Persian origin, in her trademark colourful flowing robes against a map of South London where her various facilities are located. The handwriting tells the story of Camila herself, of her chairty and what it does and gives information about child poverty in London. The quilt is 35 x 45 inches. You can read more ( much more!) about how I came to this series over on the Tea and Talk For Two blog. Fibre Artists for Hope currently have a collection about racisim which is touring South Africa and a show touring the US called American Spring which responds to the shooting of Traynor Martin. I am honoured to be asked to participate in this show.